Yet another way to have a running Android on PC: Now you can install an Android based motherboard on any PC case. VIA, the well known motherboard and chipset manufacturer just announced the APC (short for Android PC) Motherboard,. Provided that your PC case includes a way to place a neo-ITX format motherboard (which is half the width of a Mini-ITX), for 49 U$S you will be able to get your Android PC up and running in no time. This might be a more sound solution for you, compared with installing an x86 compiled version of Android on a Full-blown PC System, which, at the end of the day will cost you more, and also eat more power. The Android on PC motherboard uses up only 15 watts of power. 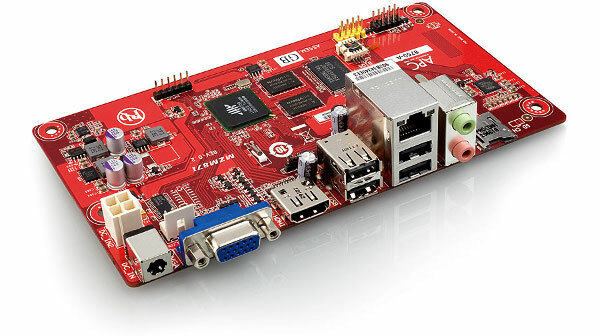 This new VIA motherboard includes the VIA WonderMedia ARM11 “system on a chip” solution. The CPU runs at 800Mhz while there is also a GPU included, capable of playing video up to 720p. On the memory side, this Android on PC motherboard includes 512mb of RAM and 2Gb of Flash memory for storage. Do not dispair after such low number of Gb: the via motherboard includes a microSD slot for you to add more storage memory. On the input/output side, this Android on PC incorporates VGA and HDMI video ports, 4 USB 2.0 ports, one Ethernet Port and two audio jacs (record and playback). It definitely has the “motherboard” look when you inspect the ports plate. On the Android side, it includes Android Gingerbread (2.3) in a special compiled version, patched up to enable working with usb mouse and keyboard instead of a touchscreen. This Android on PC solution might appeal to many people, mainly those who are more than satisfied with the computing power capabilities of their Android tablets and phones.